What is meant by Nail Deformities? Our true health represented by nails. If we have any disease or illness it will directly affect our nails. Also, accidents or injuries to nail may make them deformed. Nail deformities may also be very painful. We can get rid of most of these nail problems through small procedures which can be done on OPD basis which is done at elite cosmetic surgery center Nashik at an affordable cost. What is meant by Tendon/Nerve Repair? Any trauma or avulsion may cause injury to the important nerves or arteries of the hand, leading to functional impairment. If you take the right treatment at right time then it of this can restore hand function to the pre-injury level. What is meant by Dupuytren’s disease? Due to Diabetes, thyroid disorders, some patients develop deformities of fingers in the form of contractures and skin thickening. This leads to impaired day to day activities. At elite cosmetic surgery center which is ISO certified Cosmetic surgery center provides treatment which a can easily diagnosis of Dupuytren’s disease by hand surgery which involves the release of the constricting bands underneath the skin. What is meant by Carpal tunnel syndrome? Carpal tunnel syndrome is a common condition that causes pain, numbness and tingling in the hand and arm. Repeated use of rotating machines, thyroid disorders, diabetes may cause tingling, numbness or weakness of the hand. Due to the compression of the Median Nerve, your day to day activities becomes very difficult. To overcome the carpal tunnel syndrome we can undergo through either Nonsurgical treatment or surgical treatment. 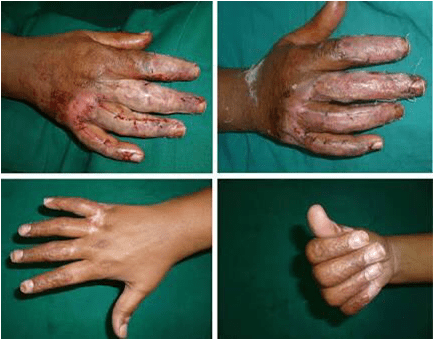 Acute injuries and chronic diseases of the hand and wrist, correction of congenital malformations of the upper extremities, and peripheral nerve problems (such as brachial plexus injuries or carpal tunnel syndrome). Hand surgery is an important part of training in plastic surgery, as well as microsurgery, which is necessary to replant an amputated extremity & elite cosmetic surgery center do this hand surgery at an affordable cost in Nashik. What is meant by Ganglion? A ganglion is a non-cancerous cyst filled with a thick, jelly-like fluid. Ganglions can develop on or beneath the surface of the skin and usually occur between the ages of 20 and 40. Most ganglions develop on the hand or wrist. This condition is common in people who bowl or who play handball, racquetball, squash, or tennis. Runners and athletes who jump, ski, or play contact sports often develop foot ganglions. This treatment is provided to the patient at an elite cosmetic surgery center in affordable price. To Experience the New Technologies Treatments in Nashik, Visit Elite Cosmetic Surgery Center for Best Hand Surgery Services in Nashik.